One of the inscriptions of Arroyo de la Luz. 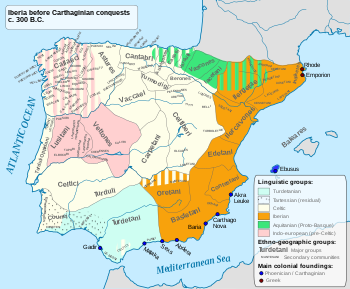 Lusitanian (so named after the Lusitani or Lusitanians) was an Indo-European Paleohispanic language. There has been support for either a connection with the ancient Italic languages or Celtic languages. It is known from only five sizeable inscriptions, dated from circa 1 CE, and numerous names of places (toponyms) and of gods (theonyms). The language was spoken in the territory inhabited by Lusitanian tribes, from the Douro to the Tagus rivers, territory that nowadays falls in central Portugal and western Spain. Lusitanian is an Indo-European language but it was quite different from the Hispano-Celtic languages of the Iberian Peninsula. 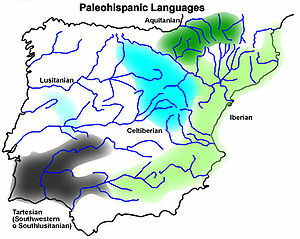 The specific language-group classification of Lusitanian remains inconclusive. It is not considered a Celtic language under existing definitions of linguistic Celticity  because the Lusitanian inscriptions found, retain Indo-European p in positions where Celtic languages would not, most unambiguously in PORCOM 'pig' in one inscription, PORGOM in another, a feature considered non-Celtic. Prósper, in her Lusitanian etymologies (2002; 2008), demonstrates that not only does Lusitanian not agree closely with the usual Celtic reflexes but that it is closer to Ligurian Italic. This suggests there may have been two well-differentiated branches of Indo-European in the Iberian Peninsula before the Romans, with Lusitanian belonging to the non-Celtic branch. Villar and Pedrero (2001) connect Lusitanian with ancient Ligurian. They base their finding on parallels in the names of deities and some lexical items (e.g., the similarity of Umbrian gomia and Lusitanian comaiam), and some grammatical elements. This once again, raises more questions about the relation of the Lusitanian language with Celtic, because the ancient Ligurian language, in many ways like Lusitanian; is considered Celtic by some and non-Celtic by others. Adding to lack of evidence and its geographical location, it has not been yet determined whether Lusitanian was part of the Ligurian language sub-group, Celtic or Celticised, or an even older Indo-European language. Prósper also sees Lusitanian as predating the introduction of Celtic and shows that it retains elements of Old European, making its origins possibly even older. On the other hand, Koch says there is no unambiguous example of the reflexes of the Indo-European syllabic resonants *l̥, *r̥, *m̥, *n̥ and the voiced aspirate stops *bʱ, *dʱ, *ɡʱ. Additionally, names in the inscriptions can be read as Celtic, such as AMBATVS, CAELOBRIGOI and VENDICVS. Dagmar Wodtko argues that it is hard to identify Lusitanian personal or place-names that are not Celtic. Furthermore, some argue that the p- in PORCOM does not alone mark Lusitanian as not Celtic, and that it could be classed as a Celtic dialect, but one that preserved Indo-European *p (or possibly an already phonetically weakened [ɸ], written P as an archaism). This is based largely on numerous Celtic personal, deity, and place names. Lusitanian possibly shows /p/ from Indo-European *kʷ in PVMPI, pronominal PVPPID from *kʷodkʷid, and PETRANIOI derived from *kʷetwor- 'four', but that is a feature found in many Indo-European languages from various branches (including P-Celtic), and by itself, it has no bearing on the question of whether Lusitanian is Celtic. Bua Carballo suggests that pairings on different inscriptions such as Proeneiaeco and Proinei versus Broeneiae, and Lapoena versus Laboena, may cast doubt on the presence of a P sound in Lusitanian. Some scholars have proposed that it may be a para-Celtic language, which evolved alongside Celtic or formed a dialect continuum or sprachbund with Tartessian and Gallaecian. This is tied to a theory of an Iberian origin for the Celtic languages. : It is also possible that the Q-Celtic languages alone, including Goidelic, originated in western Iberia (a theory that was first put forward by Edward Lhuyd in 1707) or shared a common linguistic ancestor with Lusitanian. Secondary evidence for this hypothesis has been found in research by biological scientists, who have identified (firstly) deep-rooted similarities in human DNA found precisely in both the former Lusitania and Ireland, and; (secondly) the so-called "Lusitanian distribution" of animals and plants unique to western Iberia and Ireland. Both of these phenomena are now generally believed to have resulted from human emigration from Iberia to Ireland, during the late Paleolithic or early Mesolithic eras. Inscriptions have been found Cabeço das Fragas (in Guarda), in Moledo (Viseu), in Arroyo de la Luz (in Cáceres) and most recently in Ribeira da Venda. Taking into account Lusitanian theonyms, anthroponyms and toponyms, the Lusitanian sphere would include modern northeastern Portugal and adjacent areas in Spain, with the centre in Serra da Estrela. The most famous inscriptions are those from Cabeço das Fráguas and Lamas de Moledo in Portugal, and Arroyo de la Luz in Spain. Ribeira da Venda is the most recently discovered (2008). All the known inscriptions are written in the Latin alphabet. It is difficult to determine if the letters have a different pronunciation than the Latin values, but the frequent alternations of c with g (porcom vs. porgom) and t with d (ifadem vs. ifate), and the frequent loss of g between vowels points to a lenis pronunciation compared to Latin. In particular, between vowels and after r, b may have represented the sound /β/, and correspondingly g was written for /ɣ/, and d for /ð/. ^ a b c Prósper, Blanca Maria; Villar, Francisco (2009). "NUEVA INSCRIPCIÓN LUSITANA PROCEDENTE DE PORTALEGRE". EMERITA, Revista de Lingüística y Filología Clásica (EM). LXXVII (1): 1–32. Retrieved 11 June 2012. ^ a b c Villar, Francisco (2000). Indoeuropeos y no indoeuropeos en la Hispania Prerromana (in Spanish) (1st ed.). Salamanca: Ediciones Universidad de Salamanca. ISBN 84-7800-968-X. Retrieved 22 September 2014. ^ a b Kruta, Venceslas (1991). The Celts. Thames and Hudson. p. 55. ^ a b Stifter, David (2006). Sengoídelc (Old Irish for Beginners). Syracuse University Press. pp. 3, 7. ISBN 0-8156-3072-7. ^ Hammarström, Harald; Forkel, Robert; Haspelmath, Martin, eds. (2017). "Lusitanian". Glottolog 3.0. Jena, Germany: Max Planck Institute for the Science of Human History. ^ a b c d e f Koch, John T (2011). Tartessian 2: The Inscription of Mesas do Castelinho ro and the Verbal Complex. Preliminaries to Historical Phonology. Oxbow Books, Oxford, UK. pp. 33–34. ISBN 978-1-907029-07-3. Archived from the original on 23 July 2011. ^ Markey, Thomas (2008). Shared Symbolics, Genre Diffusion, Token Perception and Late Literacy in North-Western Europe. NOWELE. ^ Prósper, BM (1999). "The inscription of Cabeço das Fráguas revisited. Lusitanian and Alteuropäisch populations in the West of the Iberian Peninsula". Transactions of the Philological Society. Wiley. 97 (2): 151–184. doi:10.1111/1467-968X.00047. ^ a b Wodtko, Dagmar S (2010). Celtic from the West Chapter 11: The Problem of Lusitanian. Oxbow Books, Oxford, UK. pp. 335–367. ISBN 978-1-84217-410-4. ^ Ballester, X. (2004). "Hablas indoeuropeas y anindoeuropeas en la Hispania prerromana". Real Academia de Cultura Valenciana, sección de estudios ibéricos. Estudios de lenguas y epigrafía antiguas –ELEA. 6: 114–116. ^ Anderson, J. M. 1985. «Pre-Roman Indo-European languages of the Hispanic Peninsula», Revue des Études Anciennes 87, 1985, pp. 319–326. ^ Untermann, J. 1987. «Lusitanisch, Keltiberisch, Keltisch», in: J. Gorrochategui, J. L. Melena & J. Santos (eds. ), Studia Palaeohispanica. Actas del IV Coloquio sobre Lenguas y Culturas Paleohispánicas (Vitoria/Gasteiz, 6-10 mayo 1985). (= Veleia 2-3, 1985–1986), Vitoria-Gasteiz ,1987, pp. 57–76. ^ Pedreño, Juan Carlos Olivares (2005). "Celtic Gods of the Iberian Peninsula". Retrieved 12 May 2010. ^ a b Quintela, Marco V. García (2005). "Celtic Elements in Northwestern Spain in Pre-Roman times". Center for Celtic Studies, University of Wisconsin-Milwaukee. Retrieved 12 May 2010. ^ Koch, John T (2010). Celtic from the West Chapter 9: Paradigm Shift? Interpreting Tartessian as Celtic. Oxbow Books, Oxford, UK. p. 293. ISBN 978-1-84217-410-4. ^ Búa Carballo., D. Carlos (2014). "I". III CONGRESSO INTERNACIONAL SOBRE CULTURA CELTA “Os Celtas da Europa Atlântica”. Instituto Galego de Estudos Célticos (IGEC). p. 112. ISBN 84-697-2178-X. ^ Wodtko, Dagmar S (2010). Celtic from the West Chapter 11: The Problem of Lusitanian. Oxbow Books, Oxford, UK. pp. 360–361. ISBN 978-1-84217-410-4. ^ Cunliffe, Barry (2003). The Celts – A Very Short Introduction – see figure 7. Oxford University Press. pp. 51–52. ISBN 0-19-280418-9. ^ Ballester, X. (2004). ""Páramo" o del problema del la */p/ en celtoide". Studi Celtici. 3: 45–56. ^ Unity in Diversity, Volume 2: Cultural and Linguistic Markers of the Concept Editors: Sabine Asmus and Barbara Braid. Google Books. ^ Hill, E. W.; Jobling, M. A.; Bradley, D. G. (2000). "Y chromosome variation and Irish origins". Nature. 404: 351–352. doi:10.1038/35006158. PMID 10746711. ^ McEvoy, B.; Richards, M.; Forster, P.; Bradley, D. G. (2004). "The longue durée of genetic ancestry: multiple genetic marker systems and Celtic origins on the Atlantic facade of Europe". Am. J. Hum. Genet. 75: 693–702. doi:10.1086/424697. PMC 1182057. PMID 15309688. Gorrochategui, Joaquín (1987): «En torno a la clasificación del lusitano», Actas del IV coloquio sobre lenguas y culturas paleohispanicas, pp. 2–3. Untermann, Jürgen (1997): «Lusitanisch, keltiberisch, keltisch», Veleia 2-3, pp. 57–76. Untermann, Jürgen (1997): Monumenta Linguarum Hispanicarum. IV Die tartessischen, keltiberischen und lusitanischen Inschriften, Wiesbaden. Villar, Francisco (1996): Los indoeuropeos y los orígenes de Europa, Madrid. Villar, Francisco; Pedrero Rosa (2001): «La nueva inscripción lusitana: Arroyo de la Luz III», Religión, lengua y cultura prerromanas de Hispania, pp. 663–698. What is necessary to decide if Lusitanian is a Celtic language? All Italic languages except Latin (and its descendants) are now extinct; Latin is still used as a liturgical language of the Catholic Church. This page was last edited on 28 December 2018, at 16:24 (UTC).